Do schools stink? What should schools quit doing right now? I’m not so sure that schools stink … I think we do a lot of things well in education. However, I know that we can do a lot better. I have been reading Tools of Titans recently since I am a huge fan of the Tim Ferriss podcast. One of the chapters in the book features James Altucher. I found his take on creativity and lists quite interesting, and that is the inspiration for this post (and I hope for many more like it in the future). This is a thought experiment in some respects. The question, “What should schools stop doing right now?” I think is an interesting one and I thought it would be fun to explore through a list of 10. 10 things schools should quit doing right now. Below is my answer to the question “What should schools quit doing right now?” I will list the 10 ideas and offer a very brief comment behind each idea. Feel free to add your own ideas in the comments below. Johnny is smarter than Susy, but not quite as smart as Miriam. Great! Now that we have sorted out all our kids we can pat ourselves on the back and head home for a job well done. Solution = curriculum designed with student interests in mind and use of portfolios. Checklists aren’t a good enough measure for teacher evaluation. Now many districts have moved toward Charlotte Danielson. This type of rubric is too far of a correction to the checklist. It is so detailed I think it actually becomes ineffective and exhausting for both admin and teachers to use as a tool. Solution = build relationships with teachers and hold them accountable to self-selected goals. 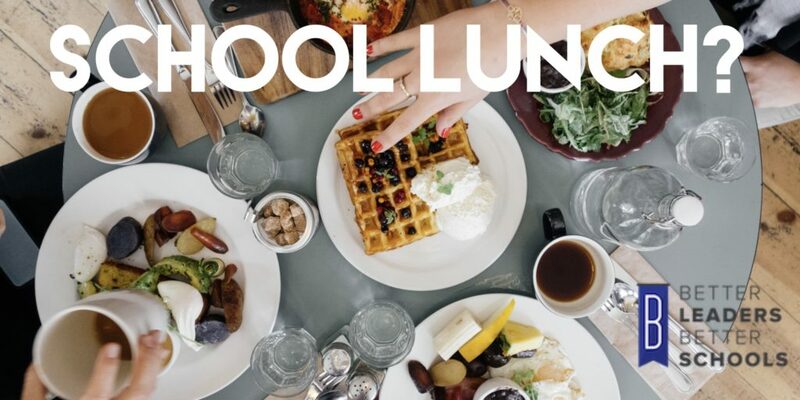 Would you eat what is served in your school’s cafeteria regularly? Solution = serve something exciting and healthy to students. Just because you did homework in school isn’t a good reason to assign it. Too often homework is busy work and not meaningful. Homework infringes on students ability to develop other necessary life-skills and plainly enjoy life outside of school. If they don’t give homework in Finland, then why do we? 5. Keep a standard 8 period day and focus on minutes and seat time. American schools are often criticized for remaining unchanged for nearly 100 years and focused only on producing compliant factory workers. Solution = create flexible class periods that are aligned, fluid, and project based (authentic). 6. Detention and Suspension as a go-to “consequence” for undesirable choices. IMO serving detentions and suspensions doesn’t teach a kid anything (other than “bad” kids get punished). When is the last time Charlie got a detention for talking and stopped talking a week later because of that punishment? Solution = Restorative practices and mindfulness. I’m worse off as a leader if I lead in isolation. The same is true for teachers. We know that 2 minds are better than 1, so we should organize schools in this way too. I also think it helps from a community point of view … two students taking the same class from two different teachers shouldn’t have a drastically different experience. There should be some alignment within the curriculim. Solution = Professional Learning Communities. 8. Low-level work that could be found in a quick Google search. Stop asking students to do what they can just look up. Help them solve interesting problems and understand how to evaluate materials. Solution = Read “Stop stealing dreams” by Seth Godin. My favorite part of school was band and choir. I loved to draw. My other favorite part of school was socializing – making friends and talking to girls. Why do we cut these opportunities for our children? Art and socialization produces better human beings. It makes school fun and interesting. I don’t remember anything I learned in Calculus AB, nor do I think I use it on a daily basis (I could substitute just about any class for Calc). Solution = Grow arts programs and create more spaces/times for students (and faculty for that matter) to connect. 10. Getting rid of recess. Way to go USA … we have the most overweight adults in the world according to the World Health Organization. By cutting recess, PE, and serving terrible lunches (without teaching kids the proper way to eat) it is no wonder! Really what it comes down to is that schools need to stop operating so traditionally. Collectively, we need to break out of the mold of how things have always been done. They say the definition of insanity is expecting a different result after doing the same thing over and over again.​ So why do we do the same things in schools expecting a different outcome? And I mean where is the innovation in school districts? Not just districts that use the idea of innovation as a buzz-word, but districts and schools that really truly live this out (High Tech High is a good example). That’s why I’m also so excited for my interview with Kyle Wagner to come out March 22nd … Kyle can help your school break out of its traditional box and provide an innovative and authentic learning experience for your kids. A question like, “What do schools need to stop doing to improve?” is an example of what we talk about on a weekly basis in a safe environment to discuss ideas to push education forward. My masterminds are a hybrid group coaching and leadership development community. Shaelynn Farnsworth: stop ability grouping. ​Learn Forward: Stop using carrots and sticks with students, teachers, and administrators. Encourage! Encourage! Encourage! ​Julie Masraff: As a former teacher, I did not like the standardized test regime and as a parent: even more so!! I do not even open the envelope when it comes home! It drives me crazy!! My two cents. ​Dr. Triplett: Differentiate learning opportunities for teachers. 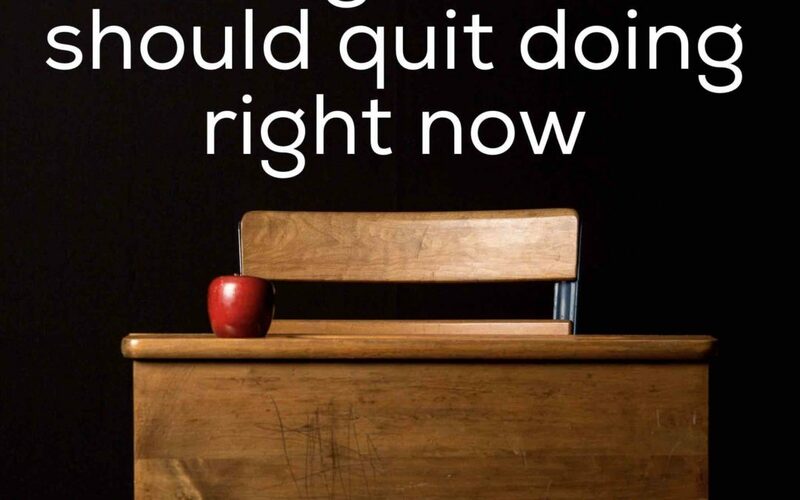 Are you enjoying this post on 10 things schools should quit doing right now? Please share on social media!